Everyone’s favourite barista is making an appearance in Animal Crossing: Pocket Camp (Free) to host Brewster’s Sweet Harvest, beginning today. Despite running a café, Barista seems to be rather fond of wine: this event focuses around grape and vineyard-themed items. The event is a typical flower planting and bug sharing event, broken into two parts and running until 2 a.m. on September 11. This event includes “Hard Tasks" for the first time. With a higher difficulty than other tasks, hard tasks reward you with different colours of the furniture you’ve already earned. These items will not appear in your catalogue. 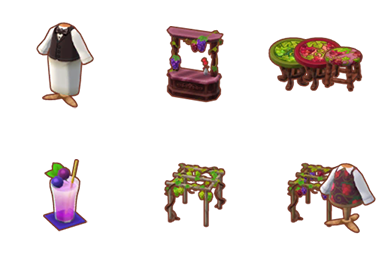 Collect 40 petite bumbledrops to earn the purple vineyard table, and double that to receive a second. Collect 70 petite bumbledrops and/or 40 jelly bumbledrops to earn a barrel of grapes. Collect 30 jelly bumbledrops to earn the vineyard phonograph; collecting an additional 20 (bringing your total to 50) will reward you with a duplicate. The second half of the event adds red berrypetal seeds and flowers to the selection; these breed either garden (green) and royal (purple) bumbledrops. Collect nine garden bumbledrops or 30 royal bumbledrops to earn Brewster’s uniform. Collect 65 royal bumbledrops and complete tasks 1-12, 2-11, 3-10, and 4-10 to earn the red vineyard vest. Collect three garden bumbledrops or 15 royal bumbledrops to earn grape juice; collecting 30 garden bumbledrops will also reward you with juice. Collect 25 garden bumbledrops to earn the vineyard counter, and 15 more to receive another. Collect 60 garden bumbledrops to earn the red vineyard stool. Collect 70 garden bumbledrops to earn the red vineyard table. Collect 35 royal bumbledrops to earn the red vineyard trellis. Collect 55 royal bumbledrops to earn the green vineyard table. Collect 75 royal bumbledrops to earn the green vineyard trellis. With part two of the event, you’ll also get the chance to get more of select items available in the first half. 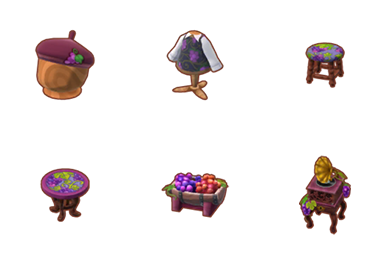 Collect 2 royal bumbledrops for a barrel of grapes, and 20 total royal bumbledrops for a purple vineyard stool. 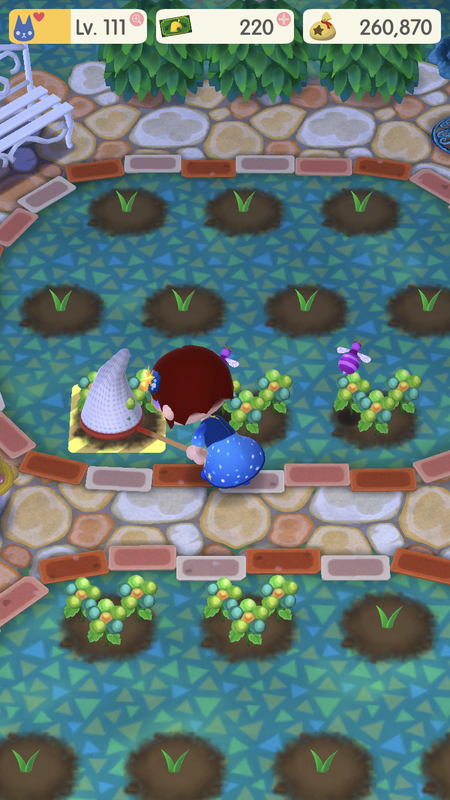 Aside from furniture and clothes, you can always receive potted flowers: trade 20 green, blue, or red berrypetal flowers with Lloyd to receive potted berrypetals of the colour traded. Part one of Brewster’s Sweet Harvest event is on through the event’s conclusion on September 11. Part two of the event begins September 4, and ends at the same time. With several events ending recent after running simultaneously, it will be nice to focus on just one. A tip: if you’re struggling, make as many friends as possible and share your bumbledrops – it’s the fastest way to gather them!